← Now that’s fairly ironic. Don’t miss the Brooks Brothers’ sale! I am a pretty cheap guy; just ask my wife. For lots of products, that is not a problem since the American products are just as cheap as those from our pals in China. But that is not true for everything. So, I am generally aware when the American made stuff I want is going on sale. I never miss the Brooks Brothers’ sale. I went in last week and bought three beautiful dress shirts at the Brooks Brothers’ store in Seattle at 40% off the list price. 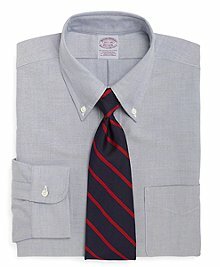 I got three classic Oxford cotton dress shirts: a white one, a blue one and a blue striped one. Not all of Brooks Brothers’ clothes are made in the States, but lots are made here, especially their suits. Next big sale to be on the lookout for if you are in need of apparel made by members of our extended American family: The Nordstrom’s men’s sale starting early next month. This entry was posted in american made, Apparel and tagged Brooks Brothers, Clothing, Dress shirt, Made in the USA, Oxford, Seattle, Shirt. Bookmark the permalink. 2 Responses to Don’t miss the Brooks Brothers’ sale! My first and so far only BB experience was a classic blue blazer I bought two years ago at the store in downtown Chicago… I’m still wondering why a blazer made in Thailand was $400!